^ a b Goolrick, p. 87. Catton, Bruce, Terrible Swift Sword: The Centennial History of the Civil War, Volume 2, Doubleday, 1963, ISBN 0-385-02614-5. Gallagher, Gary W., Ed., The Fredericksburg Campaign: Decision on the Rappahannock, University of North Carolina Press, 1995, ISBN 0-8078-2193-4. O'Reilly, Francis Augustin, The Fredericksburg Campaign: Winter War on the Rappahannock, Louisiana State University Press, 2003, ISBN 0-8071-3154-7. 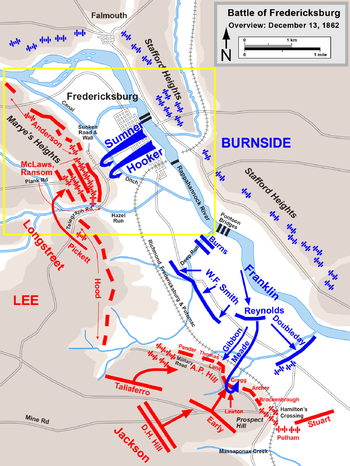 Tucker, Spencer C., "First Battle of Fredericksburg", Encyclopedia of the American Civil War: A Political, Social, and Military History, Heidler, David S., and Heidler, Jeanne T., eds., W. W. Norton & Company, 2000, ISBN 0-393-04758-X.